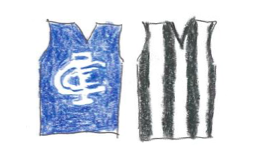 Round 3 – Carlton v Collingwood: Is there a better feeling than giving Carlton a belting? Is there many feelings better than giving Carlton a belting? No? Alright then. Let’s get this down. Set the scene. The Pies, under external pressure during the week. The Blues, winless as well, but with a bit less pressure being heaped on Bolton’s shoulders. I’ve seen the articles. I believe that Kane Cornes said that if we didn’t beat Carlton, Bucks would go. I personally don’t agree with that statement, but the stakes were fairly high. An 0-3 start is never a good thing, as Carlton, who have started that way in five of the last six years (I checked), could tell you. We get to the ground an hour beforehand (Dad and I, Mum hates being there anytime until ten minutes before the ball is bounced), and we take our seats. Fourteen Pies are out on the ground, even with the AFL’s crackdown on the pre-game warm up, and they’re looking good. Hitting every target, kicking goals, getting a good feel for it. It is shaping up to be a good nihgt (thanks to the Cheersquad for that one), until the first few minutes of the game. We look slow, similar to the Hawthorn game. The enemy get three quick ones, and it doesn’t look good. Enter Sam Murray. I really like the look of this kid. He has dash, is fairly clean, and generally makes good decisions. After we get a quick one from a Varcs handball to WHE, Muz grabs the ball at half back, and instead of the slow kick to the flank, he takes off up the middle, putting a perfect ball out in front of Varcs, who gives it off to WHE again, for another goal. Better signs, and we go into quarter time up by four. The second act is like watching your favourite film (The Shawshank Redemption), and just loving it over and over. Seeing us kick 5.4 to two points is something that we don’t see often, but we decide to capitalise on the opportunities. Goals to JT, Reidy, Rusty, and Ads put a good buffer between us and the enemy, and we go into half-time up by 36. The game seems to peter out after half-time, with neither side really looking majorly enthused. I think Bucks said later that we should have gone at full pace for longer, and I agree. We decide to let Carlton finally get a couple, after kicking the previous ten, through a couple of dubious free kicks to Casboult. Seven goals to eight after half time, but the enemy’s hearts are clearly not in the game. JT ends the game with five, a career best. It is so good to see him turn his footy around, after the two year ban. He has knuckled down, and really fought hard for a spot in the team. It is up to him to show that he belongs, and so far, he has done that task fairly well. Rusty worries me for a second, with a dangerous tackle on Fisher, which results in the Blue leaving the field. Nothing should come of it, but on Saturday it is revealed he has received a $2000 fine. On the subject of Rusty, I truly believe that he is the next captain of Collingwood. I love the way in which he plays the game, and to finally be recognised with a Copeland last year is very well deserved. He may be, as the commentators stated during the broadcast, the best kick on both feet in the game. I have been watching him ever since his TAC cup heroics (ten goals in the grand final in 2008), and I still have no idea what foot he actually kicks with. See his goal in the third quarter, for instance. Forty out, on the boundary, on his left foot, and manages to snap it almost post-high. This is followed by a bullet coming off his right boot shortly after. He is supremely skilled, and criminally underrated outside of the club. Maybe that can change in the coming weeks. Reg Grundy is developing into the best ruckman in the league, we have an amazing midfield, led by Pendles, Ads and Tay, along with a great young forward in Billy. Our defence seems to be strong, with Shaz, Mayo, Muz and Darce (hopefully) holding it down for a while. We have the pieces in place for a great year, we just need it to all click into place. I am optimistic about our chances, starting with this Friday. Adelaide in Adelaide is a big ask, but nothing in footy is impossible. And with who we have coming back (Billy kicked five in a 130 point win in the VFL), I think we have a good shot. It is revealed on Monday that Muz is this weeks Rising Star nominee, and rightly so. People questioned the move in the offseason, bringing in an untried defender from Sydney who had been stuck in the NEAFL, but I loved it. And now more than before. Our young talent is promising, and I look forward to the coming year. On another note, our VFL team kicked 31.15 on Saturday, to beat the Northern Blues by 130 points. If Carlton could ‘win’ the wooden spoon on all three levels (AFLW, VFL, AFL), I would be ecstatic. Wouldn’t that be a fun sight to see. But I guess it’s too early to judge anything like that yet. Wishful thinking, I suppose. Gordon, there’s nothing better than beating Carlton. Essendon and others are kidding themselves if they think beating them means more. Spot on with your Sidebottom thoughts. Magnificent footballer and surely the only choice as our next captain. 3 wooden spoons for Carlton would be a beautiful, beautiful thing.